GIS touches our lives every day. The processes of improving traffic routes for ambulances, mapping wildfires, selecting locations for retail establishments, and sending aid to those in need following a natural disaster have been made more efficient through GIS. GIS Day highlights the important contributions made by GIS technology, but also shows that GIS does not work aloneGIS users are making a difference in our world. GIS Day has grown to an annual worldwide celebration of GIS users, students, and educators in more than 80 countries who have joined the mission to share their geographic knowledge with others. GIS Day is the ideal forum to introduce GIS technology to a new audience, showcase your organization's products and services, and participate in community projects. St. Helena Island's GIS office celebrated its first GIS Day with local students and community members. During a GIS Day kickoff celebration at the National Geographic Society in 1999, Jack Dangermond, Esri president, said GIS Day was inspired by Ralph Nader, consumer advocate and environmentalist, as a way to inform the public about the emerging role and benefit of GIS. Nader encouraged attendees to become effective citizens and embrace GIS technology as a way to better our communities. "GIS is a tool for you to use," said Nader. "Maps speak very powerful messages." Dangermond summed up Nader's vision by suggesting that everyone get involved in their neighborhoods because this can create a whole new way of life and being. Nine years later, more than 10,000 organizations have upheld this vision and kept the GIS Day momentum going strong. Bowyer-Singleton & Associates, Orlando, Florida, a firm providing professional planning, engineering, environmental, and surveying and mapping services, celebrated GIS Day for the first time in 2007. The firm used GIS Day as a way to promote its GIS department to current clients and prospective customers. Attendees were shown all aspects of the organization's GIS mapping capabilities, including property searches, parcel research analysis, regional aerial photography, and site utility mapping. Following GIS Day, several clients requested private meetings to see demonstrations with their project of interest. "About every two to four weeks now, since GIS Day, we have been doing private GIS demonstrations to various clients and have either gained new clients or gained more GIS services," says JoAnna Duguay, GIS analyst. "GIS Day received such rave reviews from clients and management here that we have now extended GIS Day and will be going to all other Bowyer-Singleton & Associates offices in Florida." Pull out your atlas and look at the South Atlantic Ocean; there you will find St. Helena Island. 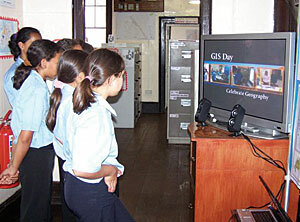 The island's GIS office celebrated its first GIS Day with local students and community members. Enthusiasm and creativity overshadowed the lack of resources as the office turned into a GIS educational facility. Slide presentations and the GIS Day promotional video were shown on a plasma screen set up in the foyer, and maps were displayed throughout the office. In another room, computers were used to demonstrate GIS and showcase the island's geography. The attendees particularly enjoyed finding their location using satellite imagery. Guest speakers shared how GIS is used in their profession and encouraged attendees to be geographically aware of our world. The Oregon State University (OSU) Department of Geosciences, along with the Department of Forest Science and the OSU Valley Library, celebrated GIS Day by organizing activities aimed at educating visitors of all ages about the role GIS plays in our lives daily. More than 400 area middle school students participated in a GPS hike; OSU students collected information about GIS internship and career opportunities; and the entire community was invited to attend GIS presentations, view map displays and demos, and experience firsthand the City of Corvallis, Oregon, mobile GIS truck. Additionally, the Department of Geosciences had the clever idea of incorporating a fund-raiser into the day's events; its GIS-themed bake-off raised money for the GeoClub. GIS Day 2008 will be held on Wednesday, November 19, 2008. For more information, visit www.gisday.com or contact Caitlyn Mitchell, Esri's GIS Day coordinator (e-mail: cmitchell@esri.com).